In this thread you can post your range and driving style/conditions for the Holden/Chevy Volt. Please keep this topic factual and leave discussion to other sections of the forums. I will be the first..
58 kms range, winter now, in Snowys.. charged 3 times.. all 58km. Last edited by g4qber on Sat, 23 Nov 2013, 05:11, edited 1 time in total. trying the volt on P100 now. Last edited by g4qber on Sat, 23 Nov 2013, 05:14, edited 1 time in total. 72.3 isnt too bad.. I havent tested my range yet.. shows 62km range, but I mainly use it around town so only charge it up once a week. My 6.3 kw divided by 37.3 kms = 0.1689 kw per km = $0.05 cents per km on electric (Please note the figure from the wall will be slightly higher due to losses etc between the wall and the battery) . This figure although pretty good, is only at town speeds. I see your litres per 100 figure over 6.. was that with air con on? Last edited by marty11 on Sat, 23 Nov 2013, 06:16, edited 1 time in total. The fan on the volt seems to drone more noticeably than the imiev. Last edited by g4qber on Sat, 23 Nov 2013, 11:51, edited 1 time in total. 4.8 l per 100 kms . . So total kms using extended range 599.3 kms. Although those figure look good, factor in almost 3,000 feet drop in elevation from Jindabyne (960 metres above sea level) to zero above sea level ..
85km's range on ev was possible by use of regen whenever possible. I expect on the return trip figures to be the other way around as I go back uphill! Took a pic on the mobile just before I started to re- charge just now. But v. happy with this trips figures! Yours seems pretty good , after thinking about it, as my kwh's used is 15, so approx 4.4 was regen provided going downhill. Take theregen provide kms off the 85 range achieved, and our figures arent that far apart. Last edited by marty11 on Wed, 27 Nov 2013, 11:40, edited 1 time in total. My 1/2013 Volt now has 20600km on the clock and used 168.9 litres of fuel for 0.8 L/100km. Including trips to Denmark and MR.No problems. Last edited by g4qber on Thu, 08 May 2014, 04:38, edited 1 time in total. was also taking the volt around Barbagallo track yesterday. interestingly the battery level was dropping at race speeds even when set in HOLD mode. probably cos the volt is using battery to boost performance. unfortunately volt is not programmed to charge battery back to 80% like outlander. Last edited by g4qber on Sat, 12 Jul 2014, 06:19, edited 1 time in total. I have only had my Volt for a few months now but in the colder weather I could get 65-70K per charge, every day, heater up high and heated seats on, warmer weather now and it's rare to get under 85K from a charge with aircon on and not exactly driving slow. 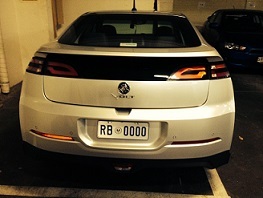 I have 3 phase at home and used to charge at home only, now I charge at the car park at the Adelaide City Council car park in the mornings, mostly on quick charge to get out quick to let others in for the afternoon - part of charging etiquette. It does not seem to make any difference how I set the charge rate but I prefer if possible to slow charge when I can to be kinder to the batteries, even though they are warranted for 8 years, in fact the whole electrics, drive train, batteries, motors, the lot are all warranted for 8 years. charged up last night, got 66km on range meter. as it negotiates a 15 amp charge and doesn't trip RCDs. Last edited by g4qber on Tue, 06 Jan 2015, 14:16, edited 1 time in total. It should read 108 miles. .still, although he is a hypermiler, that is around 174 kilometers electric, on a single charge - in a PHEV, with spare generator to go on gas another 400 + kms. Well suited to Australia, pity we cannot buy them . Best I have done is 85 kilometres electric in my 2013, but that was at a speed of 115. Second-hand Volt bought in Summer early 2018. I got 75km routinely on the guessometer in Summer and 55km in Canberra Winter. Now as it warms up again, it has crept up to about 70km. A tank full of petrol adds 600km.